The Russian Supreme Court's decision banning the work of the Crimean Tatar Mejlis will be contested in the European Court of Human Rights (ECHR), Refat Chubarov, the chairman of the Mejlis and the Ukrainian parliamentarian from the Bloc of Petro Poroshenko faction, has said. "Because we have responded to the calls made by our European partners and filed an appeal with the Russian Supreme Court, although we understood how it will end, because we have passed this stage, the next stage will be a claim filed with the European Court of Human Rights," Chubarov said at a press conference in Kyiv on Friday. 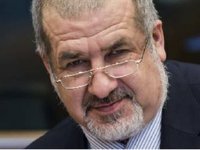 Chubarov also said the Mejlis will continue working despite the ban. "No one can ban the Crimean Tatars' fight for their rights by banning the work of the Mejlis," he said. On September 29, the Russian Supreme Court upheld the ban on the work of the Crimean Tatar Mejlis in the territory of Russia as an extremist organization. The appeal filed by representatives of the Mejlis was thus declined. The Mejlis is an organization not registered in Russia that seeks the status of a Crimean Tatar representative body. Chubarov, the incumbent leader of the Mejlis, and Mustafa Jemilev, the former leader of the Mejlis, now live in Kyiv. Crimean prosecutors consider them involved in the power blockade of the peninsula. Several cases have been opened against them. Crimea has a population of some 1.9 million people. Some 12% of them are Crimean Tatars. Soon after the Russian Supreme Court handed down its verdict, the Ukrainian Foreign Ministry issued a statement demanding immediate reversal of the decision and "full termination of the harassment on the Crimean Tatar community in Crimea."